Carrying multiple boxes of .22 ammo while squirrel hunting was something I didn't care for. I wanted a good number of rounds with me, but hated the hard rectangular boxes in my pockets. Enter the British made leather pouch. I ordered two pouches and use one to carry ammo. It is a little bigger than a tennis ball, and holds about 3 boxes of loose ammo. Much easier to carry and access than the rattling and fumble-prone ammo boxes. 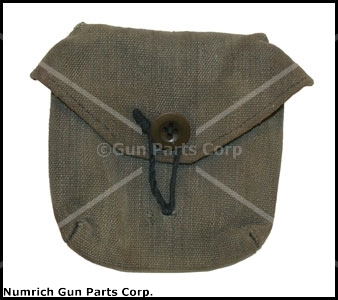 The other pouch carries everything that I would put in a small metal survival container, minus the rattle and corners. And, being a bag, you can always stuff in one more thing. The build and leather type is critical, as there are plenty of leather pouches out there that I find worthless. The flat, split cowhide type with a drawstring looped through punched holes doesn't cut it. Optional, a sewn in hanging loop comes in handy. Here's something similar I could find quickly on eBay, but has punched lanyard holes, and is a little taller than mine. Under $6. Good idea, but why leather? Why not Cordura or another weave of nylon? My question as well. It also is likely that storage in a flexible medium (either medieval or New Age) will tend toward accelerated abrasion and wear of components carried within. Leather has some other uses. It can handle hot things and it can protect your hands from sharp things. It is generally more durable and will not melt. Good leather is a good idea for a bag. I like it. I don't know if the website does this anymore, but it used to be if you call their order phone number, you were greeted with a recording that specified "the code of the day". You would then hangup, go order on their website, apply the code of the day, and get free shipping. Handwashing these pouches with dish detergent or laundry soap removes the "battlefield smell" that some of them have.